I am thrilled with how this technique worked. It looks almost like an etching of a mechanical wind-up bird toy. 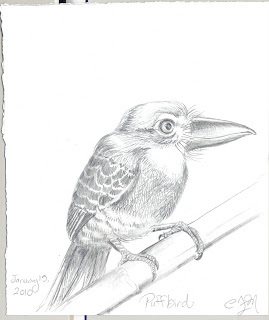 I am drawing most of these birds off of the "Wildlife Fact Files" my dad got for me as a child, (Thanks, Dad) so I am learning little random factoids about the birds as I draw. Fun fact about this bird: the Germans call them "lazy birds" because they sit completely motionless for long periods of time waiting for prey such as insects. I was waiting for this one. This is one of my favorites. I find that some fourth graders, like this bird, can sit motionless waiting for recess.